It is time to remodel your kitchen. The layout and style are chosen. You know how your new kitchen will look when it is done. Staying within your chosen budget is the next challenge of a kitchen-remodeling project. A kitchen remodel budget worksheet will help you stick to the plan and make your dream kitchen a reality. Remodeling your kitchen is a costly endeavor. It is one of the most expensive remodeling projects. There are appliances, lighting, counter tops and so much more that it may be hard to stick to your budget. Using a kitchen remodel budget worksheet will help you keep to your budget and keep you from over spending. Simply download our worksheet and fill in your custom budget for every aspect of your project. Our worksheet is a great way to see where your budget is going. Track how much you spend on each aspect of your new kitchen. This worksheet is totally customizable and free to download. Stay on budget and finish your kitchen the way you envision it. When you put it all on paper, you will see exactly how much you are spending, where you are spending it, and what there is left of your budget as you are moving along the remodel. With this free kitchen remodel budget worksheet, your remodel will go as smooth as possible. 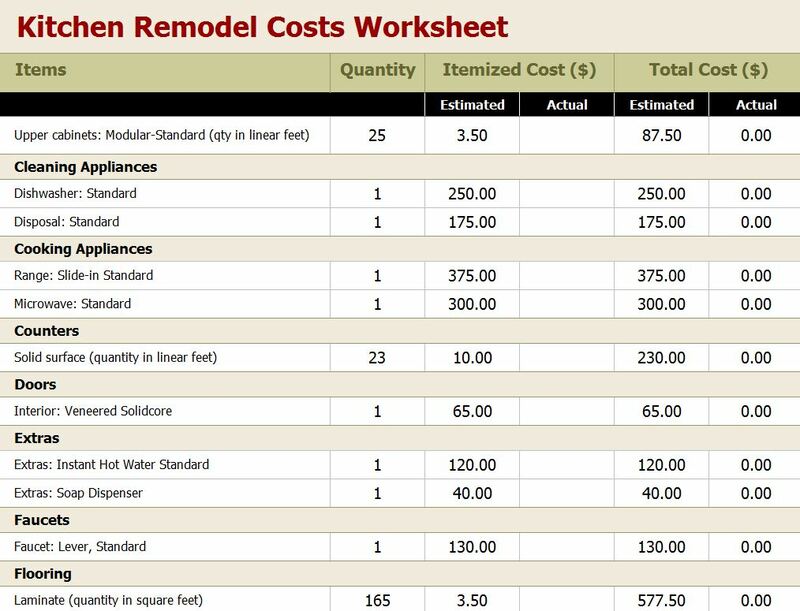 Once your remodel is finished, the budget worksheet will show where the budget was spent. Keeping to the remodel budget will take some of the stress of remodeling away, allowing you to enjoy your new kitchen without the stress of overspending. Our kitchen remodel budget worksheet is the number one tool that your project needs. Without it, it is difficult to tell where the budget is going. Remodeling your kitchen takes careful planning. Choosing a color scheme, appliance styles, countertops and cupboards is a lot of fun, but it can be the cause of a lot of stress. Do not stress your project budget. Use this worksheet to keep on track and enjoy the fruits of your labor: A beautiful new kitchen. All finished and within your chosen budget.